The Comic Book Legal Defense Fund is proud to team up with Image Comics to launch our 2014 convention program with the release of the CBLDF Exclusive Deadly Class #1 Liberty Variant, featuring a stunning variant cover by Nic Klein premiering this weekend at Wizard World Portland! 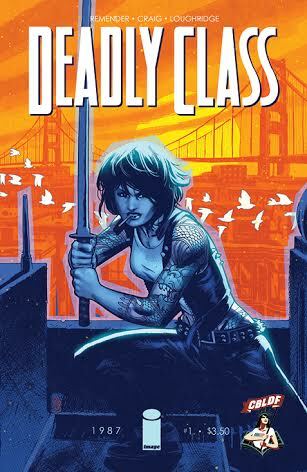 Deadly Class #1 unites Rick Remender, Wesley Craig and Lee Loughridge for the tale of how the most dangerous and damaged teenagers on earth took on the 1980s underground. Limited to 1,000 pieces, the Deadly Class #1 Liberty Variant is available for contributions of $10 each for card-carrying CBLDF Members, or $20 for non-members. To get your copy of Deadly Class #1 Liberty Variant, please visit CBLDF Booth #646 at Wizard World Portland, opening on Friday, January 24.